Quick serves focus on contemporary interiors and premium menu items for a more sophisticated feel. The days of dingy, dull, and outdated fast-food joints may soon be a thing of the past. Quick serves are meeting the demands of an evolving consumer base to remain competitive with the fast-casual sphere, using everything from sleek interiors with comfortable booths and flat-screen televisions to healthy, fresh food and drink offerings. To meet this demand, Wendy’s last year introduced a $10-million-plus prototype, which it considers the future store model. The first restaurants were built to act as laboratories to perform consumer research and measure consumer attitudes toward upgrades and transformations. The units feature a contemporary design, multiple seating options—including lounge chairs next to a fireplace—and technology like WiFi and flat-screen TVs. 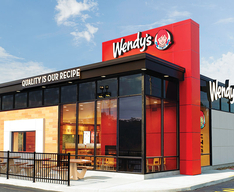 According to Technomic, a Chicago-based consulting firm, Wendy’s evolution is a result of the shift in market share between limited-service and full-service segments over the last decade. Limited-service restaurants, which owned about 47 percent of the market 10 years ago, now control 53 percent of the market. This trend has caused fast-food restaurants to work “overtime to upscale their menu and concept positioning—not only to keep pace, but to compete directly with fast-casual leaders,” Technomic states in a recent report that explores the blurring of fast-food and fast-casual restaurants. Evidence of this trend can be found throughout the quick-service restaurant landscape as huge players in the market upscale their menu. Taco Bell’s Cantina Bell menu, for instance, consists of higher-quality items such as gourmet bowls and burritos. Taco Bell partnered with celebrity chef Lorena Garcia for the menu initiative, which includes new ingredients—like whole black beans, citrus and herb–marinated chicken, and cilantro rice—all to satisfy a consumer base that has become more sophisticated. Other large quick-service chains, such as Arby’s, Burger King, and McDonald’s, have focused on upgrading their menu, their stores, or both. Burger King recently launched a Fall Premium Chicken Menu, while McDonald’s is continuing its billion-dollar makeover of the majority of its stores. Though it’s routine for quick serves to upgrade stores and menus, it occurs largely on an incremental basis. The McDonald’s makeover isn’t expected to be complete until 2015, and Wendy’s will gradually build new restaurants in the coming years. The next phase of the Wendy’s project involves building about 50 restaurants, costing nearly $750,000 a piece, that will reflect consumers’ interests, needs, and desires. One of the overriding factors in deciding whether to upgrade stores and menus is franchising. Given the capital investment needed to complete the project, franchisees pose a wrinkle in the process of redesigning stores. Other factors that play a role in a store’s upgrade are the age of the existing unit and the financial health of the chain, Tristano says. McDonald’s has gone with remodeling existing restaurants, while Yum! Brands has built new locations because of the age of some of its units. This entry was posted on Thursday, December 13th, 2012 at 8:37 am and is filed under Food, Franchise Activity, Health & Wellness, Ingredient, Quick Service. You can follow any responses to this entry through the RSS 2.0 feed. You can leave a response, or trackback from your own site.